My most frequent sewing project is, without a doubt, baby blankets. All different shapes, colors, themes, sizes. It’s my favorite gift to give at a baby shower, and you can pretty much rest assured the receiver won’t get a duplicate. Whether you’re doing tummy time, reading books on the couch or heading outside for a picnic, baby blankets are sure to get used. Recently I’ve had the pleasure of making a bunch of blankets, so tonight I will walk you through my process. There are plenty of standard sizes for blankets, but you can absolutely use your imagination when planning out your blanket. The first blanket was made for a new baby in my very extended family, I will say. A beautiful little girl named Isabelle. I actually used fabric from my stash (still working away at it…….) and I was really happy with it. Previously I had used these exact fabrics to make Big Sis and Little Sis blankets for a good friend of mine. 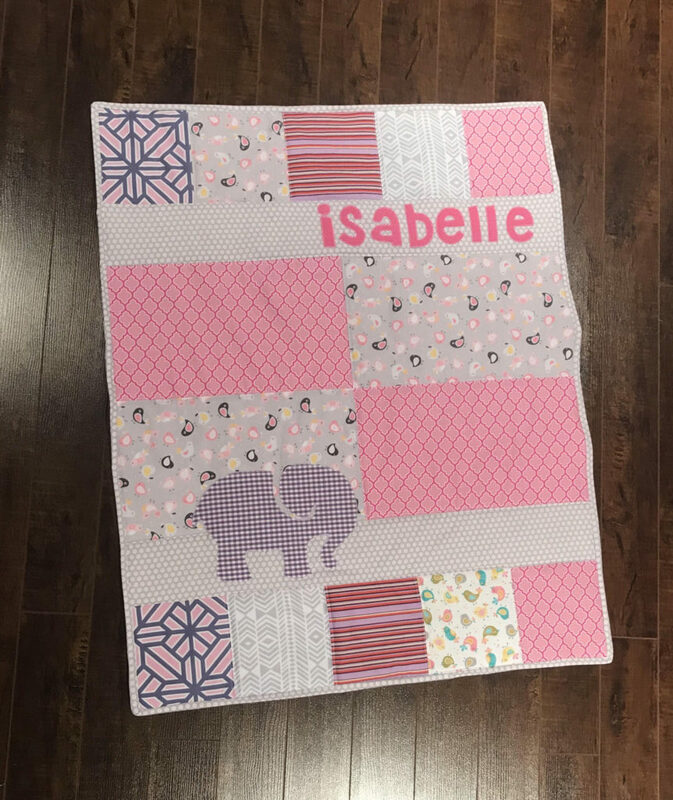 I made a mini version of that quilt for Isabelle. I started by drawing out a pattern. I cut 10 6X6″ blocks for the top and bottom of the quilt. I cut 2 30X4″ pieces for the long rectangular sections. Then I cut 4 15X8 pieces for the center. I knew that once I joined the pieces I could trim the uneven edges caused by the seam allowances. Sometimes I am more precise, but this time I didn’t feel the need to be. 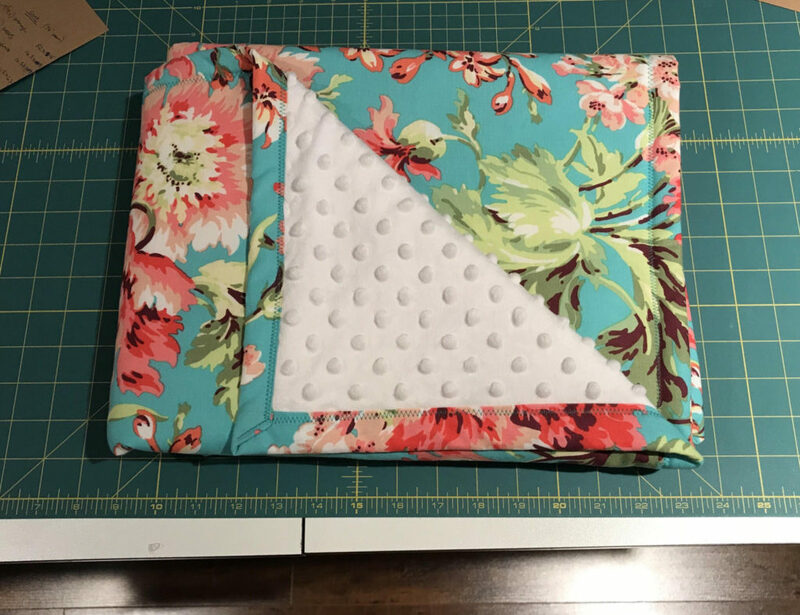 I used a 1/4″ seam allowance and joined the blocks across each row. Once each row was formed, I joined them horizontally to form the blanket. It came together quite quickly as there weren’t that many pieces. 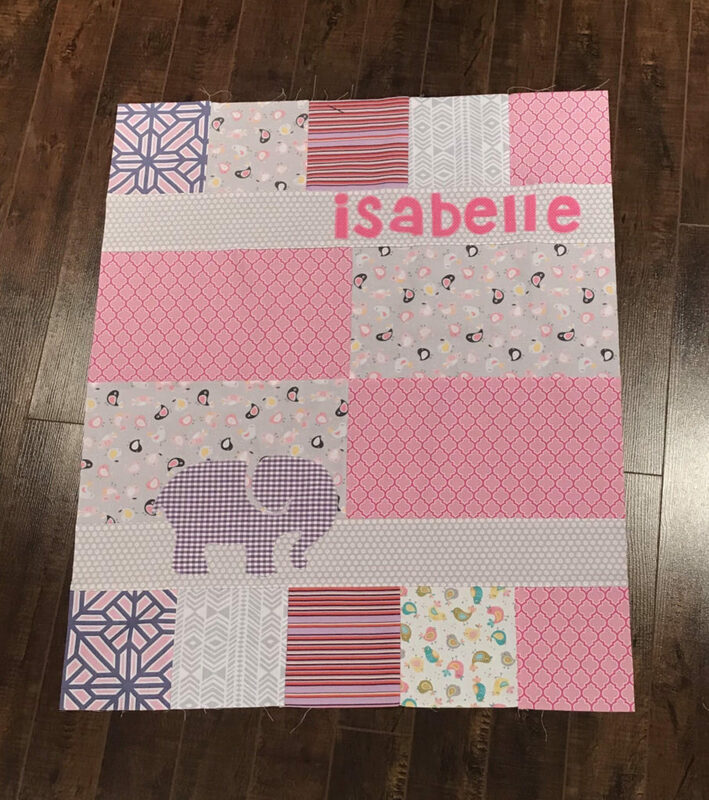 This is a photo of the quilt top once I appliqued the elephant and her name. I gave the fabric a good press with a hot iron here to flatten out the seams. I picked out cotton batting for the centre of the quilt and a soft minky for the backside. Once I put the quilt together with right sides facing out and the batting in the middle, I started pinning the 3 pieces together. Lots and lots and lots of pins. The next step is to quit down the fabric. 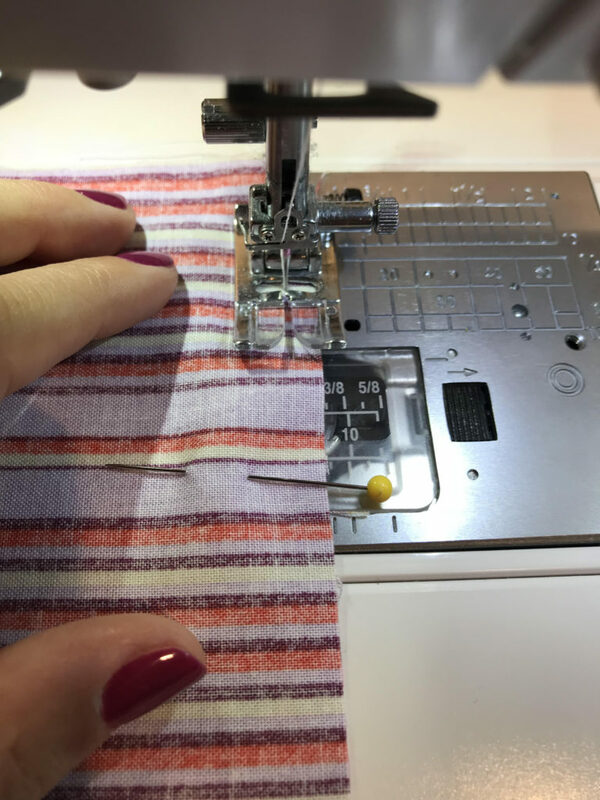 This essentially means you will sew all 3 pieces together in some pattern, which will help the blanket keep its shape over time as it gets washed more and more. I quilted down along each seam on the quilt, both sides of the seam in fact. So I essentially made railroad tracks right on top of each seam. This part takes a bit of time but really does add to the blanket. Once the quilting down was complete, I made the binding for the edge of the quilt. I cut 2.5″ wide strips of cotton and used this technique to join it to the quilt. Some people hand sew the binding in place but I don’t typically do that. I actually don’t enjoy hand sewing, and the time commitment is significant. Voila! A personalized gift that will get used over and over and over and over….. The next blanket was quite simple and was made for a customer. 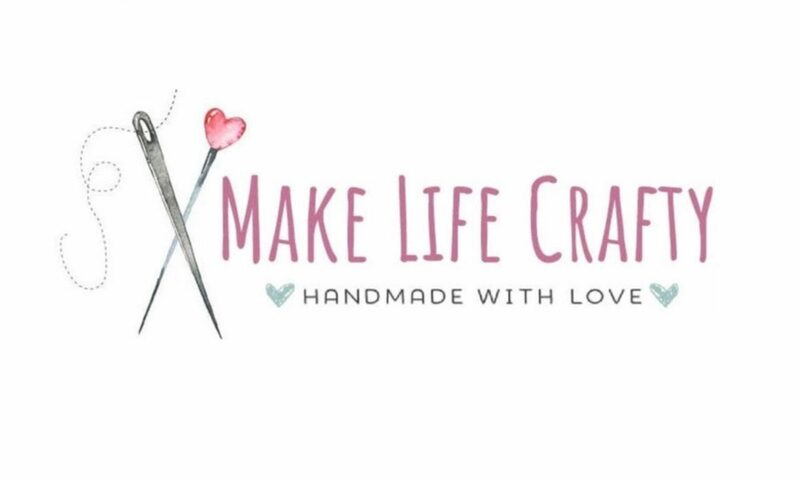 She gave me permission to share this project with you. 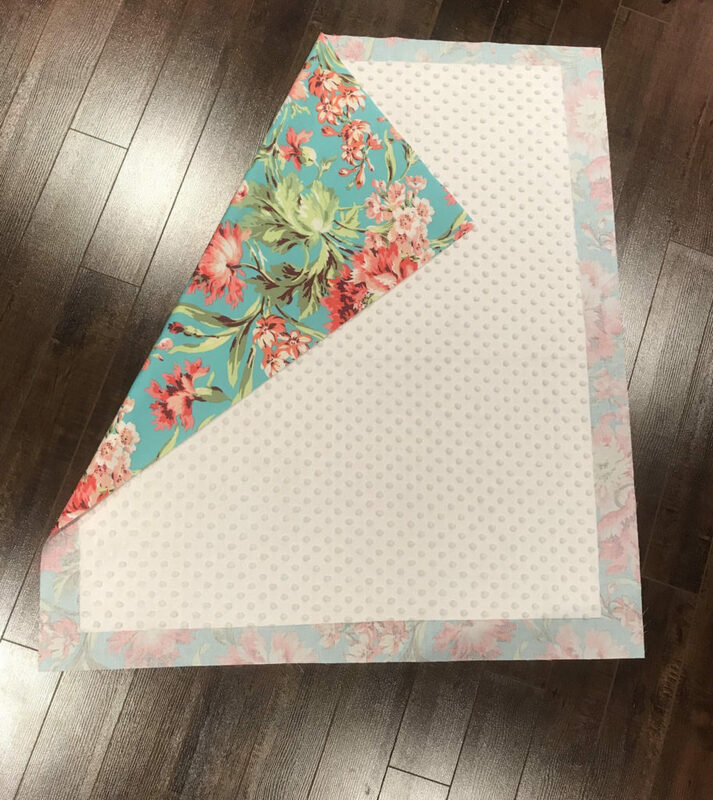 The customer had seen fabric by Amy Butler called Bliss Bouquet (in Teal) and fell in love. She wanted a baby blanket made for her soon-to-be-arriving baby girl. She wanted a basic blanket with minky on the back. I picked up a slightly cream colored minky fabric and got sewing. She wanted a blanket that was 28X33″. I started by ironing the cotton Amy Butler fabric. I cut out a rectangle that was 32X37, to ensure I had plenty for a nice folded edge over the minky. I cut the minky and the cotton batting to 28X33. I laid out the pieces on my floor and smoothed out any wrinkles. Next I went around the edge of the blanket, folding down the printed cotton twice, and pinning in place in preparation for sewing. I zig zag stitched around the blanket and it was done! This blanket is so soft and pretty, and took about an hour to make. There are many variations of baby blankets and they really do make wonderful gifts. You can get really creative and mix colors and prints, and you never have to do the same blanket twice. I hope you’ve enjoyed this post. Thanks for stopping by today! I have always wanted to make adorable baby hats. Babies wear hats all year long – fuzzy hats, wool hats, fleece hats, baseball hats, bucket hats, you name it! 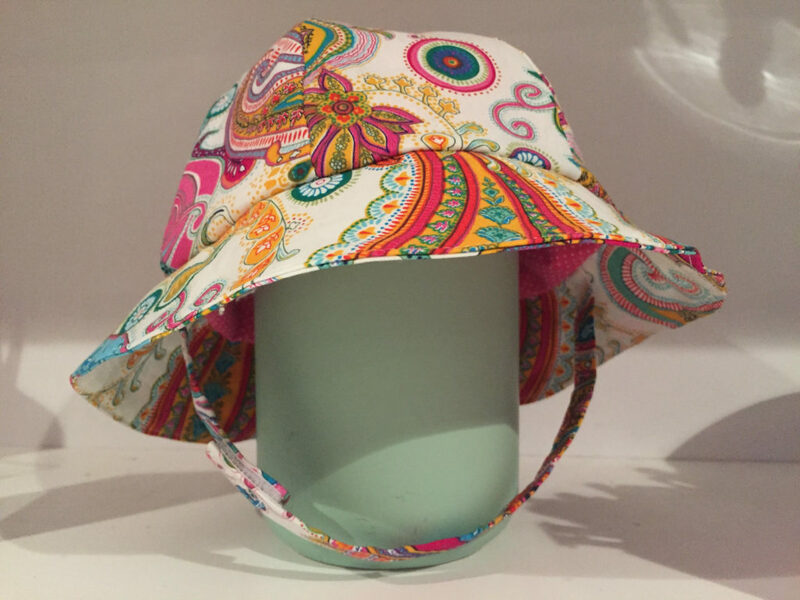 Hats keep their little heads warm but also protect them from the harmful effects of the sun. This week I found a pattern that I will share my review of today. It’s Kwik Sew 3989 and it’s a really darling little hat. 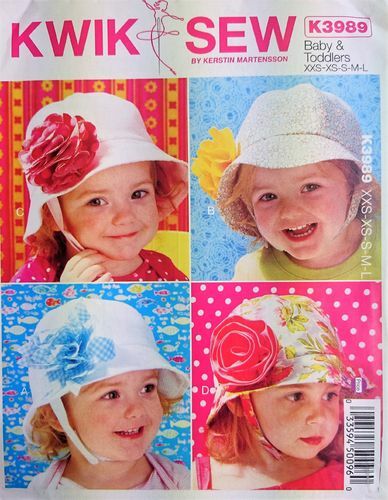 This hat can be made plain or with one of 4 flowers (pattern included). I decided to do plain because I was using a rather lively patterned fabric. This hat took me about 40 minutes to make. In sewing terms, that’s “kwik” indeed! I love the hat pattern. I made this in size L (the largest size, unfortunately) because it’s a gift for Connor’s friend who is turning 1 this week! Happy Birthday, Brooke! I did lengthen the chin strap as well. It’s adjustable because it has a velcro closure, so you could also make it a little more snug. If the strap is too snug it may be uncomfortable for the baby or the Velcro may irritate their delicate skin. My model today is a coffee tin. This pattern was easy and quick. The instructions were extremely easy to follow and I was able to make a second hat a little quicker than the first. For this pattern you need 0.8 metres of fabric (0.5 metres for hat, 0.3 metres for lining), with 0.4 metres of interfacing, plus a very small piece of Velcro. 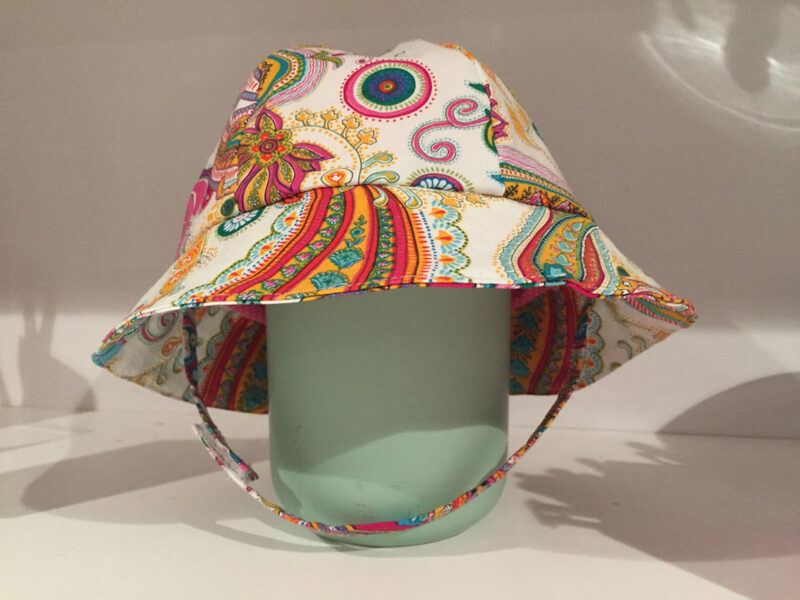 If you’re an avid sewist there’s an excellent chance you can make this hat from scraps in your stash. I will remake this hat soon in a more neutral print, and *possibly* do a couple for my son. I hope you’ve enjoyed this pattern review. Happy Sunday!